The Indiana State Library has an abundance of books on a variety of types of textile art. I found 127 on embroidery alone in our catalog. These include not only instruction books, but books showing how embroidery can be high art, as well as texts that tell its history. 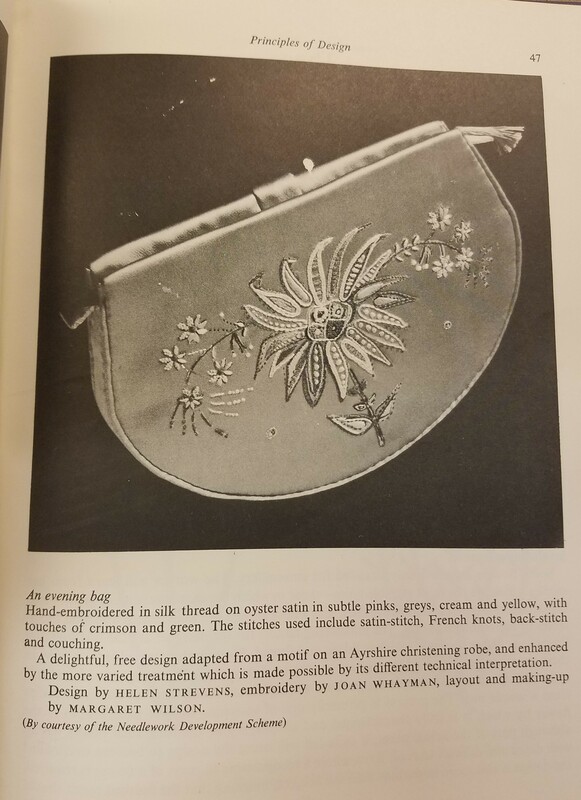 The brief history of embroidery in “Design for Flower Embroidery” by Elisabeth Geddes (ISLM 746 G295d) mainly focuses on how floral patterns were used throughout the history of embroidery. The book states that textiles were first produced in the New Stone Age, also known as the Neolithic Era, and that a “later development was the addition of patterning worked into the warp threads with a needle.” It also mentions that bone needles were being used thousands of years before woven cloth was created. The author suggests that floral patterns were significant due to the fact that people would have seen the flowers as a sign of easier living and the hope of a good harvest. There are illustrations of floral patterns from different eras, such as the Egyptian Amratian period, as well as a few geometric patterns from similar time periods. The book also includes detailed descriptions of the items shown as examples. Included are descriptions of the colors of the items, which is good since the photos are in black and white. The evening bag shown below is one of these examples. 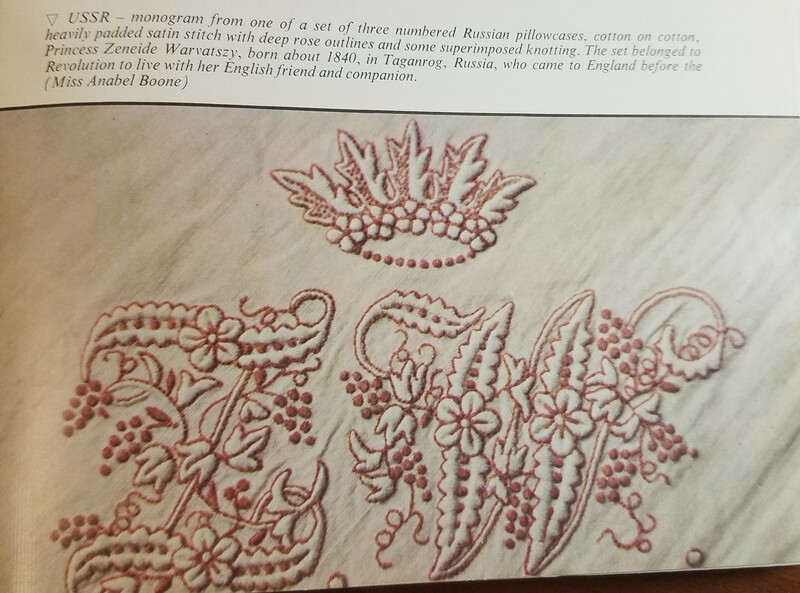 The book “A World of Embroidery” by Mary Gostelow (ISLM NK 9206 .G67) contains examples of works of embroidery from around the world. An embroidered cap from Nigeria, a whitework kappie from South Africa and a gargoush mezzahar, which is the ceremonial headgear of Jewish women of Sana’a, Yemen, are included as a few examples of headgear. The book also contains a number works that are exquisite works of art from different countries, as well as brief descriptions of the types of embroidery done in those countries. The image below is of an unusual item of embroidery; it is a flour sack embroidered in Belgium. These were the sacks from food sent to Belgium by the United States during World War I. 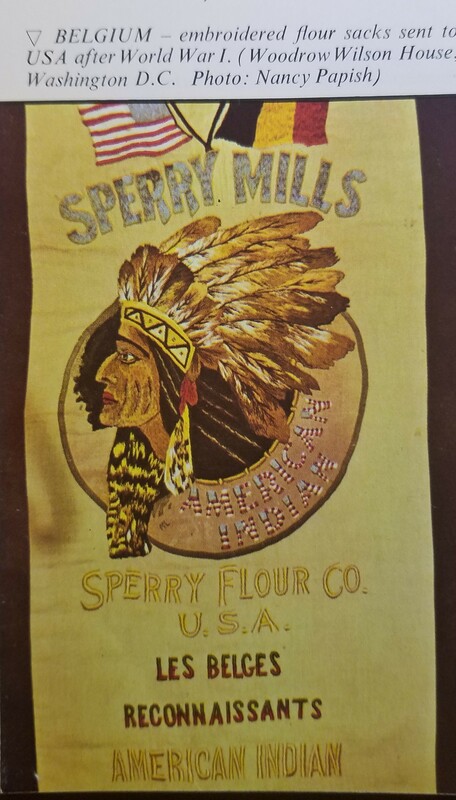 So, to show their appreciation to President Wilson and the Belgian Food Relief Committee, groups of Belgians embroidered the logo on the flour sack. It was then sent to the president and the committee as a gift. The two images below are examples of everyday items being made more beautiful. The first is of a pillowcase used by the Russian Princess Zeneide Warvaszy, who left Russia to go to England before the Russian Revolution. 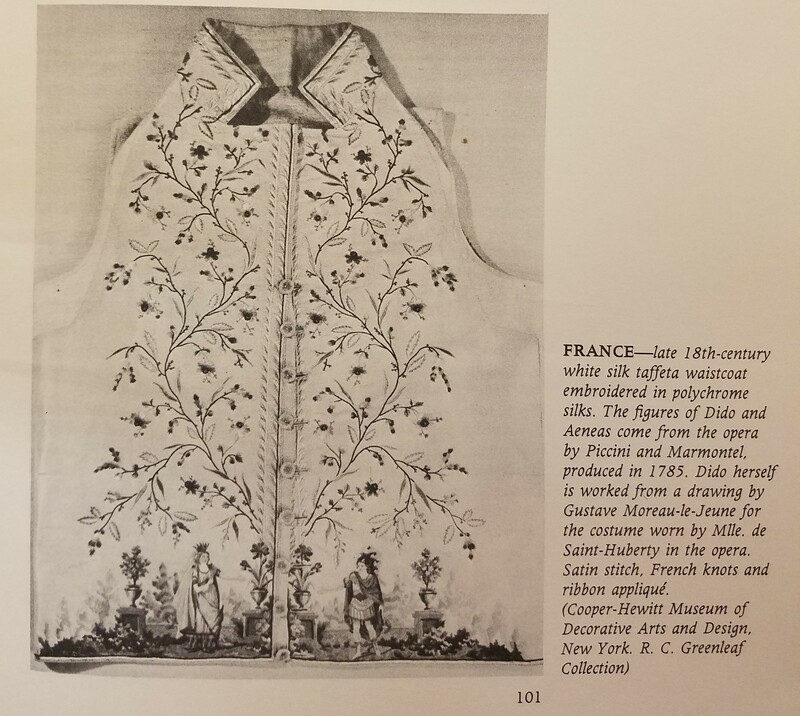 The second image is of an elaborately embroidered waistcoat that would have been worn by someone who had the money to have such an artistic expression created. If you are inspired to possibly do a bit of embroidery yourself, we have instruction books with detailed descriptions of different stitches. One of these books is “Mary Thomas’s Dictionary of Embroidery Stitches” (ISLM 746 T459m). It contains instructions and illustrations for 210 different stitches. The stitches are arranged alphabetically, but the book also has a “Uses at a Glance” section so you can find out which stitches to use if you want outline stitches, insertion stitches, border and band stitches, etc. We also have “Art Nouveau Embroidery” by Lewis F. Day and Mary Buckle (ISLM TT 770 .D27 1974) that has more in-depth descriptions of the types of stitches, rather than the individual ones. Come take a look at our collection of embroidery materials to see which ones will work for you. Also, you can check our catalog for other textile art materials. Weaving, rug-making, knitting and more… we have it all here at the Indiana State Library. This blog post by Daina Bohr, Reference and Government Services Collection librarian. For more information, contact the Reference and Government Services department at (317) 232-3678 or email us at Ask-a-Librarian.